Day Five - The Forbes River where we camped is at the top bit of the far right. Tia Falls is at far top left. The steep and winding section of Oxley Highway is the part through the darker green. While it rained overnight, it was mostly very light. We do not have far to go today, only about 100 kilometres, so we are in no rush to get up. We did not get out of bed till at least 9 am and then had breakfast. We spend time reading our books. Around this time it starts to rain much heavier. When we arrived here last night, the small creek next to us had two branches flowing into the Forbes River. The secondary one had almost stopped flowing by first thing this morning. By midday, this branch is pouring much more water into the river than it was last night. The rain is far too heavy to pack up so we just sit and read all day. We have discussed the fact that if possible, we need to move to Tia Falls if possible as this will cut down our travel tomorrow which will be a long day. However, it just keeps raining. Finally, about 2:30 pm the rain starts to ease and is soon just a fine dizzle/mist. We make the decision to leave. We pack up and at 3:35 pm, we depart. It is almost 12 kilometres out to the Oxley Highway. 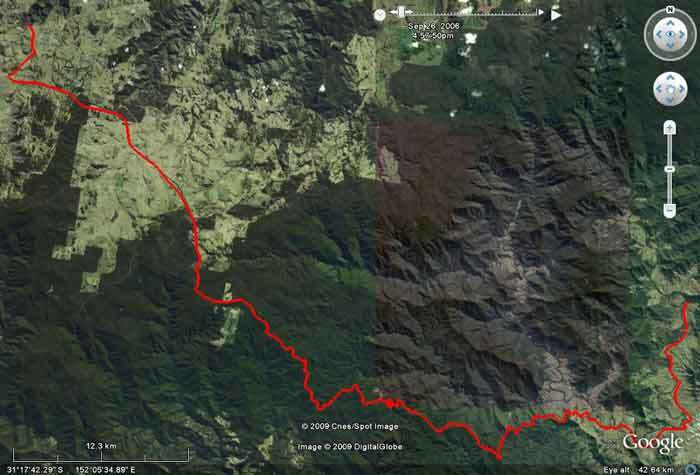 We head west and start the climb from 100 metres up to almost 1200 metres. It is a very winding road and we only average under 55 km/h. 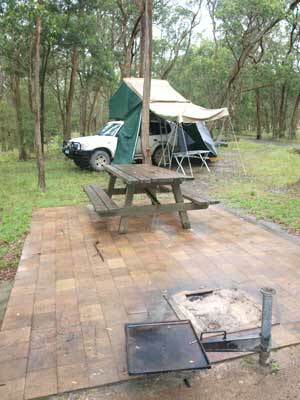 At 5:10 pm we arrive at the Tia Falls Camping Area in Oxley Wild Rivers National Park. It is about seven kilometres off the highway along a single lane tar and dirt road. The camping area is quite nice, with about four spaces, each capable of taking two cars. Each one has a table and one of the best fireplaces/barbecues I have seen in national parks. There is also a pit toilet. After setting up our tents, we go for a walk to Tia Falls. This is along a walking track that starts from the picnic area. It is a few hundred metres to the lookout. This has a great view back to the falls from the other side of the gorge. 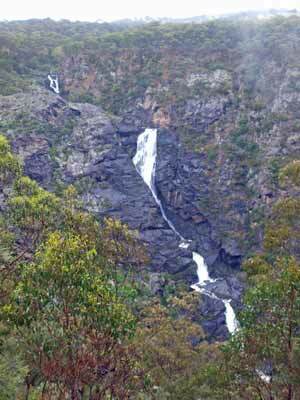 Another 100 metres along the track is another lookout that has views up the gorge. After the walk we return to the camping area for drinks and dinner. Kelly and I use the barbecue provided to cook some very nice lamb loin chops and sausages. We have a few after dinner drinks and finish the night reading in bed. The rain has been very light, on and off, during the whole evening.